Heat oil in a non-stick pan and splutter mustard seeds. Add onions, green chillies and curry leaves. Fry till the onions turn light brown. Add chilly and turmeric powders. Fry for a second and add the tomatoes and salt. Mix well and cook covered for 10 minutes on a medium flame. Mash the tomatoes occasionally. Open the lid and simmer till the gravy is thick. 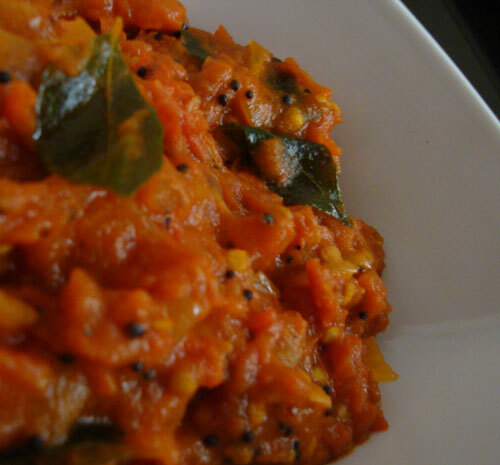 Delicious ‘Tomato Chutney’ can be served with idli, dosa, rice or chapathi. Enjoy! Never made a chutney before but when the tomatoes are in season I shall definitely make some. 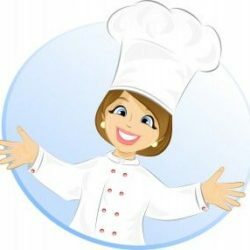 Everything you make motivates me to go into the kitchen. 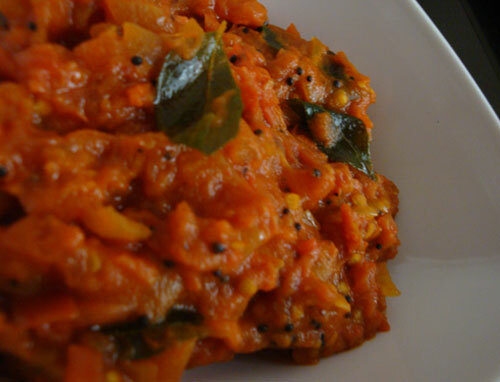 chutney looks yummy and great combo with iddli. Wonderful recipe.. first time here.. Awesome job!! Thanks for the tasty side dish. I also added a pinch of asafoetida to chutney.